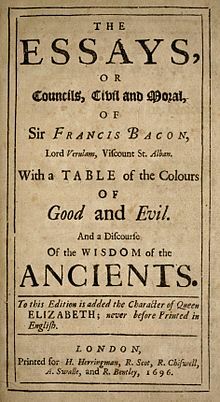 Bacon's genius as a phrase-maker appears to great advantage in the later essays. In Of Boldness he wrote, "If the Hill will not come to Mahomet, Mahomet will go to the hill", which is the earliest known appearance of that proverb in print. The phrase "hostages to fortune" appears in the essay Of Marriage and Single Life – again the earliest known usage. Aldous Huxley's book Jesting Pilate took its epigraph, "What is Truth? said jesting Pilate; and would not stay for an answer", from Bacon's essay Of Truth. The 1999 edition of The Oxford Dictionary of Quotations includes no fewer than 91 quotations from the Essays. ^ Bacon, Francis (2000) . Kiernan, Michael (ed.). The Essayes or Counsels, Civill and Morall. New York: Oxford University Press. p. xlix. ISBN 0198186738. Retrieved 13 May 2012.